Good food, spending time with family and friends, and fantastic fishing - what a great Thanksgiving week. I really enjoy fishing with kids, and I had several opportunities to do that during Thanksgiving. 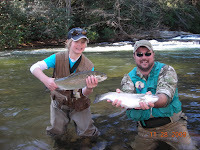 Jay Corte from Alabama had fished with me back in the summer on the Toccoa tailwaters and caught several fish. He wanted to fish NCF for larger fish and you can see from the pictures above, he caught those too. His Dad was along to take pictures and he did a lot of that because Jay caught a lot of nice fish. The pictures above left are Rick McKibben and his sons, Jay and Ross. Neither of the boys had ever been fly fishing for trout. They caught on fast and were hooking and landing big rainbows in a short time at Frog Hollow. Sorry Dad, but I believe the boys caught the biggest fish. What a great family to spend time with on the river . 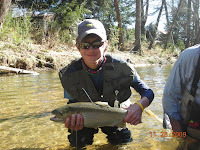 The picture to the right is Robert Schultz on his first fly fishing trip - pretty good for a beginner, huh? We fished at NCF and I think he landed 5 nice fish before he lost one. Well, he said his nickname was "lucky" - in fishing, that counts a lot. Robert really got into the fishing and I believe he enjoyed it almost as much as I did. I think he may be "hooked" for life. Thanks to Jay Corte and his Dad for fishing with me again, to Rick and his sons Jay and Ross,for sharing this special family time with me, to Robert for his enthusiasm, and to my son Kevin for spending time fishing with his "old man". And thanks to the folks at Unicoi and to Eddie for allowing memories like this to happen.